How do you know if you’re due for a wheel alignment from your favorite San Dimas area auto repair shop? You’ve got to pay attention to your car. If you listen to it, it’ll tell you everything you need to know. Too often, drivers will ignore all the little signs their cars give them that something’s not quite right, which usually results in a far bigger repair bill than they originally anticipated. 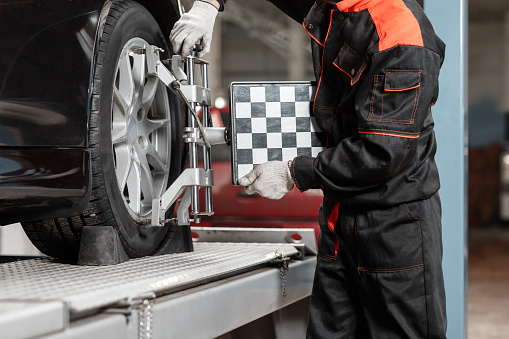 If you suspect your alignment is off, set up an appointment with an alignment shop near me and make sure you tell them you want your wheel alignment checked out ASAP. As we always like to say, if you do right by your car, it’ll do right by you. By tuning in to how your car usually behaves, you’ll be better able to tell when something’s wrong. You’ll know you’re due for a wheel alignment service here in San Dimas when your car starts showing, or pulling to the left or right on its own. If you find yourself having to fight with your steering wheel a little (or a lot), it’s time to get it checked out. Other signs can include uneven tread wear on your tires or unusual vibrations from your steering wheel while driving. All of these signs are easy to catch as long as you get to know your car. When you’ve come fresh from your last car service, take a few minutes while driving to really feel how your car moves, listen to the sounds it makes, and notice how sensitive your instruments are. This will give you a good baseline going forward. Now you can compare any unusual noises or vibrations to that baseline and determine whether something’s going on under the hood, or in the wheel wells, as the case may be. Give you’re an alignment shop near me a call and they’ll be able to verify, but more than that, they’ll be able to fix it. When you catch these issues early, you end up paying far less than if you let them go until the car needs serious repair. It’s worth it! Johnny’s Auto is a full-service auto repair shop that’s here to take care of you and your car, whatever you need. We’re a local business with a long history in the area and the certifications to back up our expertise. You’ll have access to ASE Master Technicians when you come here, so there’s no better place to come for wheel alignment in San Dimas. If you have any questions at all about how to get to know your car, feel free to ask! Call us at (626) 966-5212 or fill out our online form to schedule your appointment today.